The World Arya Vysya Mahasabha in Andhra and Telangana is furious with the provocative assertions of Dalit writer and intellectual Kancha Ilaiah. In his book Post-Hindu India, Ilaiah describes the mercantile caste (vysya) of India as ‘social smugglers’ who essentially generate wealth by nefarious means, hoard wealth away for use of their families and do not share it with the rest of society. There are calls for criminal defamation against the writer, who now fears for his life and has placed himself under voluntary house arrest. The sweeping generalisation resonates with the tendency to paint the banias of India, especially moneylenders, as dark, dangerous, and evil. This was a common trope in older Bollywood movies too, such as Mother India and Do Bigha Zameen. It contributed to the general suspicion in post-Independence socialist India of all things commercial and entrepreneurial. Nobility was linked to poverty and service. 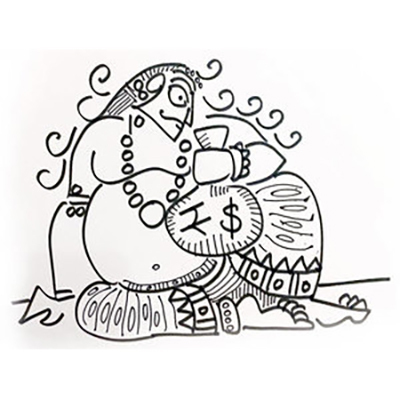 Those who sought to generate wealth were viewed as distorted by greed: deformed yakshas, with potbellies, who sit on treasures. Yet, if one visits the caves of Ajanta and Ellora, we learn how yakshas were considered sacred. A corpulent yaksha sat on one side of the Buddha and a bejewelled yakshini sat on the other. They were linked with symbols of affluence and abundance. Wealth was auspicious. In fact, one of the earliest goddesses to be visualised in India was Shree, the goddess of wealth, more commonly known as Lakshmi. She is found in Buddhist, Jain and Hindu art. In Jain Agamas, one is told that a dream of Laskhmi, of a pile of gems, of pots overflowing with grain, of cows and horses and elephants, suggested the arrival of a spiritual being. The great monastic orders of India, Buddhism and Jainism, were patronised by the merchant class. In Tamil Nadu, Andhra Pradesh, Telangana, Karnataka and Odisha one finds caves and shrines and monasteries dedicated to the Buddha and numerous Tirthankaras built by merchant guilds. They traded with Arabia, Rome and South East Asia. They exported textiles and spices and sought gold in return which is why India was named ‘land of the golden sparrow’. What led to a land that once celebrated entrepreneurs to look down upon them? Some blame the Brahmins, who were rivals of the Buddhists and Jains. Some blame the landed gentry (Kshatriya) who were threatened by traders and merchants who controlled the markets (Vysya). Some blame the kings (Raja) who took loans from these bankers in order to hire mercenaries. Let us not forget the Tamil epic Silappadikaram where the merchant’s daughter, Kannagi, has diamond-studded anklets while the queen of Madurai has pearl-studded anklets. That these bankers managed to dispassionately do business with everyone from Hindu kings to Muslim sultans to British East India Company, did not win them many friends. They were the Shylocks of India, seen as enabling the exploitation of the poor and landless. One can even argue that hatred for entrepreneurs and traders and money lenders in India mirrors the hatred for Jewish communities, who could not own land, and so could only trade, in Christian Europe. Perhaps the one thing that works against the mercantile class is that their generosity was directed mostly towards monks and deities, hence monastic and temple complexes, in order to earn spiritual merit. It was not directed towards the larger welfare of the village community. They can argue that social good was the king’s responsibility, which is why the king collected tax. However, the king was too busy living a life of luxury, or fighting his enemies who threatened his fragile hold over the throne, to bother with governance. We yearn for great kings like Ram of Ramayana and Vikramaditya of Ujjain, but they seem like the stuff of lore.